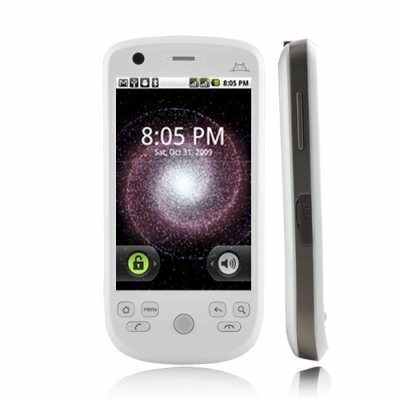 Successfully Added Eclipse - Dual SIM Android 2.2 Smartphone (White) to your Shopping Cart. And since this phone uses the latest Android 2.2 operating system, everyday task like sending and receiving emails, checking the latest weather and news reports or simply staying connected with your Facebook buddies is now easier than ever before. The new Eclipse smartphone is in stock now, ready for express delivery and comes with our full 1 year warranty. Available only from the leaders in wholesale Android phones, Chinavasion! Improved Photo Album: Makes it much easier to access and share your photos on the web. Simply select a photo and with one click you can send it to Facebook, Twitter, Gmail or MMS. A great well priced phone which does as described. All the features, TV, Dual Sim, Radio and best of all the battery life. With the extra large battery it lasts days and days between charges. Many expensive smart phones don't even last a day's use. I have looked at buying a more expensive smart phone but why? This is fantastic value for the money. on 2011-04-08 06:31:02 Eclipse Dual sim Android best for me i wiil order one. I am very happy with the kind of quality phone and electronic items from chinavasion with all these great future,I am happy with the prices. thanks Mamie kah. I received my phone within 3 working days of ordering. It was great being able to track it moving across the world. Early days yet, but everything I've tried works brilliantly. So much so I'm ordering a second one for my wife. Thanks very much Chinavasion, Brilliant product. 3 days to Eastern Europe its impressive. G Android is a future for smartphones. Also there was a small gift in the box, thank you friends.